Is marching out of bed and getting on the go everyday a daunting task that requires a well crafted espresso, maybe a double Americano? If this is your plight, you might be in search of something to make the mourning routine slightly easier or cost effective. The Stovetop Espresso machine, also called the Moka Pot, or more colloquially, the Bialetti, is a simple kitchen appliance who’s name might be slightly misleading. Stovetop coffee makers often claim to make espresso. However, the coffee they make is not true espresso, strictly speaking, but it is a sort of middle ground between regular coffee and espresso. Sometimes, this means that the stovetop is seen as a second choice, but the coffee you get is good enough in itself that it doesn’t need to pretend to be anything it’s not. This is coffeee unto a class of it’s own. And it might save you some money without all the visits to the local cafe. Stovetop machines are simple and ingenious pieces of equipment. They have been in production since the 1930s by various companies, Bialietti in particular, and the name has become synonymous with the kind of machine and it’s coffee byproduct. These stainless steel or aluminum pots are cheap and really easy to use, all you have to do is add coffee and cold water, place the coffee maker on the stove and then remove it when your brew is ready. For an in-depth review of what material makes a better Moka pot, check out our review here. These durable, eight-sided beauties are simple and affordable, uncomplicated and hugely popular means of making coffee. 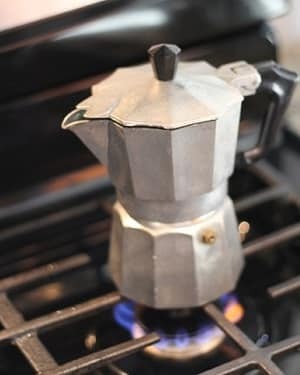 Stovetop coffee makers are household staples in Italy and other European countries that really care about their coffee. The problem with stovetop espresso (which isn’t a problem really, it’s just a poor description) is that it just isn’t true espresso. What separates it from the espresso we all know and love? Mostly what makes espresso different from regular coffee is the high pressure brewing method used. Your average espresso make is meant to push very hot water under high pressure through compacted coffee. As the coffee grounds are tamped down the water evenly penetrates and extracts. Antioxidants: Coffee is a rich source antioxidants which fight disease. Caffeine: Studies have shown that it may reduce cavities, boost athletic performance, and stop headaches. Potassium, niacin, magnesium and vitamin E: These important minerals are a part of the coffee bean and left intact through the brew process. Some scientists even think that brewing the beans makes them an easier target for absorption in our livers. Adenosine: Coffee doesn’t actually contain this chemical but helps to block it in the brain. The effects that coffee has on Adenosine actually help increase neuronal firing and support mood, memory, and overall cognitive function. Caffeine Again: Helping to elevate heart rate, even throughout the most sedentary parts of the day, caffeine does wonders to help burn fat, and improve cardiovascular health. These are just more reasons why you want to create the perfect cup as a part of your morning routine. So let’s discuss how to setup the contraption. A stove top espresso maker is very much like a traditional percolator that is used in many homes on electric or gas-lit stoves, or even on an open fire while camping. We have detailed stovetop espresso maker instructions here but to summarize read below. The Bottom Chamber: This is where you’ll put your cold water, or as some experts report, pre-heated water. The Stem and Basket: The basket is positioned above the bottom chamber, the grounds are tamped down here to prepare for the brewing process. The stem delivers water under pressure here for a short and effective extraction. The Filters: Often forgotten are the two filters; one in the basket which has the grounds in it, and the other where the stem at top chamber meet. The Top Chamber: Water under pressure will travel upwards through the stem, to the basket and two filters, and finally to the top chamber where the extraction, now drinkable coffee, is ready to be served. Careful it’s slightly hot! Stovetop coffee makers use pressure to brew, but they reach 1-1.5 bar of steam pressure compared to the 9+ bar that the genuine espresso machines generate. Your average coffee shop espresso machine (the professional level) generates up to fifteen atmospheres of pressure. That’s the equivalent pressure of around two hundred feet under water. So those are pretty powerful machines. And expensive. The pressure from a stovetop is not going to extract the beans to the same degree as a professional setup yet the cup contains much of the flavorful oils, though it is not so full-bodied, and as a result isn’t the same product as true espresso. What’s missing in the stovetop version is the crema. The crema is a characteristic of espresso that just can’t be gained from lower pressure brewing too, although there are people who swear they can brew in such a way to achieve it with manual machines, to get an authentic crema you need authentic espresso. Is Stovetop Coffee Just Regular Coffee? Yes and no. Stovetop coffee isn’t espresso, but it contains many similar characteristics. It is a strong, short coffee which, for people who aren’t connoisseurs of espresso, is a perfectly good alternative. It can be made cheaply and easily, and it tastes great once you get the hang of it. Considering the alternative involves investing in a very expensive espresso machine, there is a lot to be said for the more basic stovetop as it makes a great compromise between manual coffee machines and the true espresso it is often marketed as. So you might not have the exact equivalent of espresso with the stovetop makers, but that just means there’s a whole new class of beverages for you to experiment with. If you enjoy the occasional Americano, then the versatility of espresso is just the same for stovetop coffee. To get an americano at home, simply heat up that moka pot and once the final product is ready, pour a shot of the psuedo-espresso from your pot into a mug. Or a double if you’re needing the extra boost. Each shot is going measure about three ounces. If your digital scale isn’t on hand than a quick conversion is 3/8 of a cup. Experiment with ratios of coffee to water for variable strength espresso. Next, add hot water from your tea kettle, the amount will then depend on your taste. It’s best to use more grounds-to-water ratio to produce a defined espresso-like quality, but that is based on preference. Americanos follow an easy recipe, if you have a moka pot and desperation for a good caffeine fix then this should do the trick. It’s kind of surprising how accessible this drink is for the home coffee enthusiast. Maybe the latte seems like an illusion only capable of being created by barista wizards and warlocks. However, it’s simply an alteration of the coffee style that requires little know-how. Using the microwave to heat your milk has the ability to make a frothless latte (Not ideal). Now, create your stovetop espresso coffee while trying to get a higher concentration, like the Americano recipe above. Then pour the shot into your hot milk. Perhaps you’re used to ordering different flavor shots at the cafe. These can also be bought for the home and require some good practice on ratios. If you’re watching for sugar content and trying to stray away, then the home latte is on your side. Sometimes cafes will add sugar to their concoctions unless the order specifies not to. This drink is great for the coffee enthusiast that wants to entertain on the weekend. Made with either straight espresso or espresso with some hot water added to it, similar as discussed in the Americano recipe. Add some Irish whiskey of your preference, then stir a teaspoon of brown sugar into it. This is also by preference too. Some whiskeys are more sweet, and if using a bourbon, chances are sugar will dampen the flavor profile in the final product. Finally we will want a thick fresh cream to float on top. Here’s the tricky part. getting the cream to float will take some finesse. Hold a spoon angled downward so that it’s sitting on the surface of the coffee. Make sure the curved bottom of the spoon is facing upward. Basically the spoon should be upside down. Now, pour the cream slowly down the back of the spoon. As you pour the cream, keep raising the spoon a little so that the tip of the spoon never comes into contact with the surface – if it does, your cream will mix with the coffee instead of floating. Getting the cream to float can be a bit tricky, so much so that even your favorite of cafes might just skip this step and use whipped cream from a can instead of the fresh stuff. If you can float fresh cream on top, though, you will be rewarded with a true interpretation of the famous beverage. And the bragging right, of course. Contrary to popular belief, the hot coffee is sipped through the cream, not mixed with it. This makes it ideal to serve in a glass to show off its layers, and of course, your skills that brought this into fruition. Cappuccino and Latte, although both are made with espresso and milk, the distinction is in the technique. With cappuccino, you’ll want to make certain that the milk is frothed. This requires using the steam wand that is part of any espresso machine. Cappuccino needs to feature a “microfoam” that is about twice the volume of the original milk. To compare to the latte version we just made above, in latte, the milk is merely steamed. The microfoam required for cappuccino occurs when hot air is forced into the tightly compressed protein molecules in the milk. in the foam are formed by forcing hot air into the tightly-knit “fabric” created by the protein molecules in milk. This means that milks of higher protein content will produce a far more optimum foam. For latte, the goal is not to create that much foam, so any type of milk works. You can even try experimenting with coconut or almond milk for different results or dietary preferences. Since we don’t have the whole setup at home, we need to figure out a way to replicate the wonders created by the steam wand to get a good cappuccino with the Moka pot. So fire up that Moka pot and make some concentrated “espresso”. Obviously this is going to vary a bit since the Moka Pot doesn’t make a true espresso. Heat up about half a cup of milk in the microwave or on a stove top until its just below boiling. About a minute should do the trick you’ve got a your microwave on high. However, it is suggested to use the stovetop since it’s easy to monitor without scalding the milk. Pour your heated milk into a glass and take a whisk to it. Making sure to push air from the surface towards the bottom until the desired froth is reached. As bigger bubbles might start to develop (obviously this is not the desire consistency), you can remedy this by swirling the glass and/or lightly tapping it on the counter. This technique also helps condense the foam together, which will help it hold up over the course of the next steps. After the last whisk, pour the milk into your espresso shot(s). Finesses your wrist side to side will help the foam come out before the unconverted milk. This allows it to sit nicely on top of the espresso. A cappuccino made with a home milk steamer will provide thicker froth. Perhaps the most die-hard cappuccino lovers will find this recipe to be unconvincing. That being said, this method, from stove top espresso maker to whisk method is a great substitute for those barren desert island circumstances. As you taste your final product, the Moka pot cappuccino, ponder the differences between it and the cafe versions you have had previously. As with all coffee making procedures, there is a level of experimentation that seasoned baristas and enthusiasts will discover brings about better results. Perhaps you’d like to experiment further and try making a french press cappuccino. Check out our review of the 11+ best french presses, there is probably some better suited for your means than others. What’s the Best coffee for the Moka Pot? As your investing in further coffee explorations, chances are you’ll want to use some different coffee with your newly acquired instrument. So it’s important to define what makes a great coffee for the Moka Pot. Here’s a few rules of thumb for picking out a good bean, just remember that not al coffee is created equally, not even close. You’re going to want to go with a grind that is slightly finer than drip coffee. If you’re making a shot of espresso for any of the described styles above, then you want to go with a bean and grind it fresh. The ability to get a fine grind on your beans depends on the grinder as well. Check out the capabilities of the burr grinder versus the blade grinder to determine what your best match is gonna be. If for some reason you were to grind some coffee and be unable to use them, then you’ll need to find a way to store those precious grounds. Airtight containers will provide a thorough storage option. However, there are many options out there and the quality varies quite bit. Check out our rundown of the top five coffee containers. Just like good jazz, the best parts are discovered on the fly and by taking chances. It’s always good to have options and both stovetop and true espresso can give you that. So while stovetop espresso might not match the espresso machines in terms of flavor, the differences are not that much of a big deal to people who aren’t fussy. It’s a shame that the marketers of stovetop coffee makers seems to want to confuse people into thinking that stovetop coffee is a second-rate replica of espresso when in fact it’s a great brewing method in its own right. We invite you to take a look at all of our stovetop “moka pots” on this page. Can You Fit A Travel Mug Under A Keurig Coffee Maker?